Afternoon Loverlies! What do I think of when I read the words "The Beauty Of Grace"? I basically view it as exactly what it states. Grace is Beautiful and Elegant, especially the Grace God gives us. He doesn't have to be merciful and loving to us, but God is because he loves us. I am very thankful for his Grace. Whenever you don't feel loved at all, by anyone, it is awesome knowing God loves you. 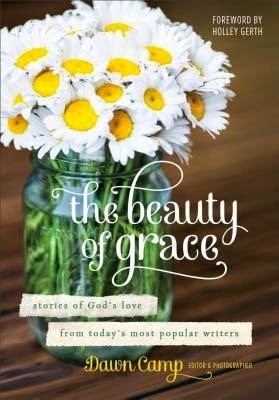 I received a book from Revell called The Beauty Of Grace: Stories of God's Love from Today's Most Popular Writers. The editor/photographer for this book is Dawn Camp, and the foreword was written by Holley Gerth. This book has short stories by many authors about how they find God in their daily struggles. I enjoyed reading each story because it shows just how human we are, and how we all struggle with similar issues. No one is perfect and we are all going to go through rough times in our lives. The best thing to do is to find God in those struggles. Yes, I know, it is easier said then done a lot of the times. You know why? Because we let ourselves get in the way of finding him. I think this book is a great way of reassuring myself that there is hope, these authors have found that hope in their struggles. Why can't I? Also God forgives me if I mess up and he has never given up hope on me. He just sits there patiently waiting for me to get up, brush myself off, and try again. I believe this book is great if you are looking for some inspirational stories. The cover is beautiful to look at and so are the pictures that are on the inside of this book. If this type of book is your style of reading, then it is a must, that you read this book. What do you think of when you read the words "The Beauty Of Grace"? I would love to read what y'all have to say. Have a Blessed Day! In this hectic life, we all need a little peace, a little quiet, and a little beauty. Combining heartfelt stories from some of today's foremost writers and bloggers with stunning photography of God's incredible creation, "The Beauty of Grace" is a haven of calm contemplation amidst the chaos. This uplifting collection includes moving stories of cultivating friendship, waiting on God, choosing joy, staying connected, and more from popular writers such as Jessica Turner, Lisa-Jo Baker, Holley Gerth, Ann Voskamp, Bonnie Gray, Tsh Oxenreider, Leeana Tankersley, Emily Freeman, Margaret Feinberg, and many others. Each story is accompanied by an uplifting Scripture verse, and the book includes Dawn's stunning photos. Foreword by Holley Gerth.